Yesterday's bridge, the Pont Sully, crossed the Ile Saint Louis between the left and right banks of Paris. 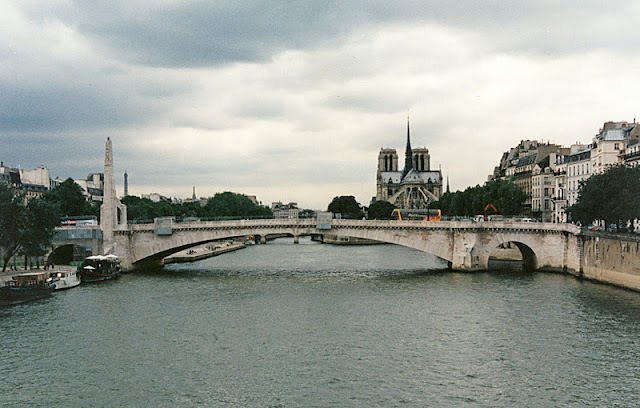 Today's bridge, the Pont de la Tournelle, crosses from the left bank to the Ile Saint Louis. It is a reinforced concrete deck arch built in 1928. It is composed of small arches at the ends and a long arch in the center. It is 122 m (400 ft) long, 23 m (75 ft) wide, and with only 7 m (23 ft) maximum clearance over the Seine. Its most unusual feature is a sculpture (on one of the cutwaters) of a church spire with Saint Genevieve standing at its peak. The spire at Notre Dame Cathedral is clearly visible downstream. This reinforced concrete bridge has rough hewn stone masonry facing stones. Seine River Bridges: Pont de la Tournelle by Mark Yashinsky is licensed under a Creative Commons Attribution-NonCommercial-ShareAlike 3.0 United States License.